As many of you noticed last night and this morning, we’ve undergone some major changes around here. We are proud to introduce you today to Droid Life 3.0. It has been two years since we last revamped the site, but in my biased opinion, this is the biggest and best change yet. There are a lot of cool things going on, so let’s talk about them. This is one of those one site built for all type of changes, or in other words, a responsive layout. No matter what you are viewing the site on, whether it be tablet, phone or desktop, you won’t have to request mobile or full versions of the site, the site will change automatically for you. To test it for yourself, grab the corner of your browser right now and drag it inwards. Neat, right? I can’t even tell you how many times that you, the reader, have requested a mobile version of the site. And truthfully, there always was one, it was just hard to find. But going forward, you won’t have to worry about finding one, clicking “view mobile,” or any of that other tedious stuff, as the site will adjust depending on your screen size. Yes, mobile is go. Tablet layout is also go. All sizes are go. From the beginning of this redesign, we wanted to see how big we could make things, yet still have the site remain functional. If it’s not obvious already from the desktop version, we went really big. We’re actually already toning some of it down thanks to immediate feedback, but we really want images to be in your face; for headings and quotes to stand out. We’re moving into a time where screens have higher and higher resolutions, so had we kept things down a notch, we worried that it wouldn’t be future-proof and things would look too small in the near future. I’d imagine that the next computer you buy is going to have a retina-like resolution if it doesn’t already. 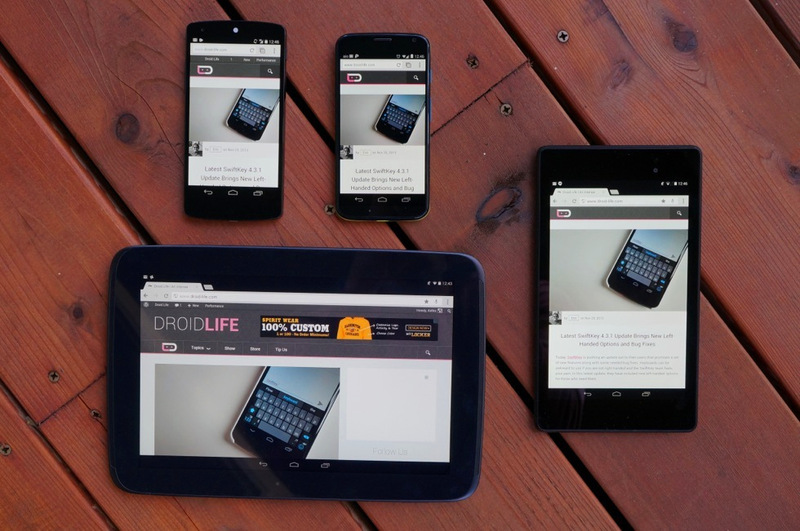 So here we are, with our big beautiful, image-heavy Droid Life 3.0. It might take some getting used to, but I think the more you look at it, the more you’ll like it. Especially as we fine tune everything to be just right. Take our Nexus 5 review for example – holy gorgeous. Oh, and assuming we can step our photography game up to make pictures worthy of this new look, that should help. And if the BIG is simply too overwhelming, you can always adjust the zoom in your Chrome browser. I know that’s not an ideal fix, but things slim up nicely at around 90%. You can access zoom by heading into Settings>Show advancing settings…>Zoom. Persistent Top Menus: From the home page to individual post pages, we’ve given you tools that stick to the top of the site even as you scroll downward. You’ll see shortcuts to get you back home, for sending in tips, quick buttons for sharing, a search box, and even some of our favorite links to places like our DL Show page or reviews. This is one of those things we can add to over time, so if you’d like to see something added, be sure to let us know. That DL pink, tho: Did you really think that we’d go away from one of our trademark looks? Of course we kept the pink around. It’s not going to overwhelm anyone (at least we hope not), but it’s there, especially as you hover over items. Previous and Next Stories: At both the top and bottoms of individual posts, you’ll see buttons to get you to the previous or next stories. In the past, you had to jump all the way back to the main DL page to find the next story, so we decided to make it easier for you to continue reading. Older Posts: As time permits, we’ll do our best to bring older posts up to snuff. Thanks to the way we were creating posts in the past, they weren’t exactly tailored for such a big change, but we’ve got some ideas to make them look much prettier over time. Stick with us there. For the daily readers, going forward you’ll see everything fit ever-so-nicely into the new theme. Guess what? We like feedback. We don’t necessarily like assholes, but we do love it when people make thoughtful and helpful suggestions. It’s a new site after all, designed by us with hopes that you’d love our vision. But you the reader are the most important piece to this whole gig of ours, so if you aren’t happy, we want to make you happy. We’d love for you to give us feedback in the comments or via email over the next few weeks so that we can make adjustments to the site as needed. Also, we’d like to give a shoutout to our friends at Coulee Creative who put this together. This is the 3rd site redesign they have done for us, and we couldn’t be happier.